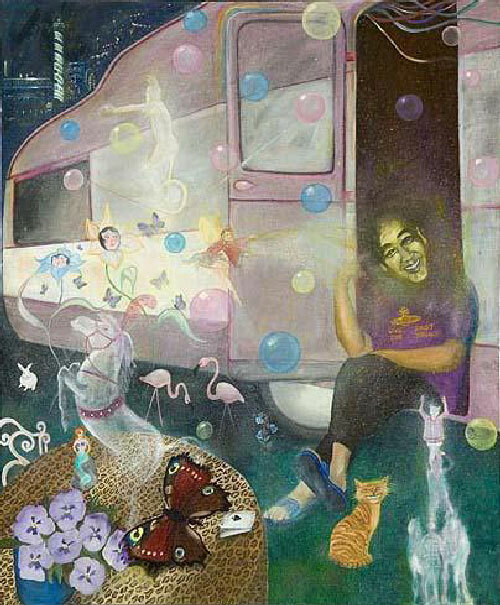 Like the conductor of a menagerie of magical creatures, Miss Kitty sits smiling on the step of her pink and white caravan in a haze of hallucinatory, drug-induced visions. Cats, rabbits, flamingoes and butterflies amuse themselves among flowers, coloured bubbles and a cast of feathery, vaporous circus performers on temporary leave from their big top. By playing with their size and scale, Harrison intensifies the colour and light of the supernatural creations that he depicts; and situating midway between the visionary and the real, he ensures that we are never quite able fully to suspend disbelief.